I have recently read that there are 7 enemies that everyman faces in his lifetime:(According to the teacher of Osamu Tezuka, Japan’s famous cartoonist) Sickness, hunger, betrayal, envy, greed, old age, and then death. The ancients of Japan knew it all along and they celebrated Setsubun, a time for exorcising demons and driving them out. On the 3rd day of February, the first day of spring in the lunar calendar, Setsubun is performed at temples and neighborhoods throughout the land to dispel bad spirits. People born in the year of the dragon, or whatever zodiac animal of the year, are given square boxes/masu filled with beans to throw out at the crowds of people who hope to catch the dried soy beans, one for each year of their age. Evil spirits are driven away by eating the beans. There is a mad scramble for them and no wonder. We all need to banish bad things from our lives, even in good years. But with frequent minor tremors that are occurring currently in Japan, and a major earthquake forecast for Tokyo in the near future, with radiation still not under control and no program to deal with it in place, with the government still pushing to reactivate the now dormant reactors – all but three -with Tohoku still reeling from the tsunami and earthquake 10 months ago and surrounded by mountains of debris that cannot be disposed of, the demons seem to be winning. So bring on Setsubun. Dispel those enemies! We feature them in our new Blue & White window, and reluctantly acknowledge their presence. 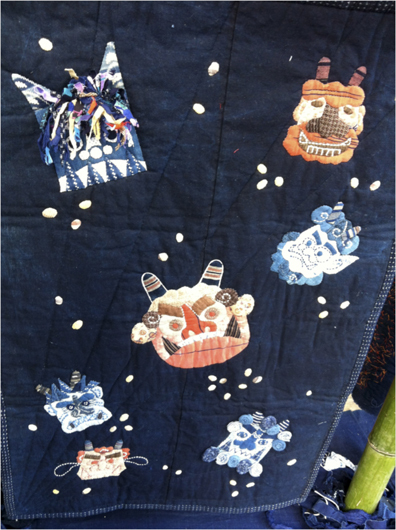 A charming Demon quilt by our star quilter, Reiko Okunushi is the centerpiece. 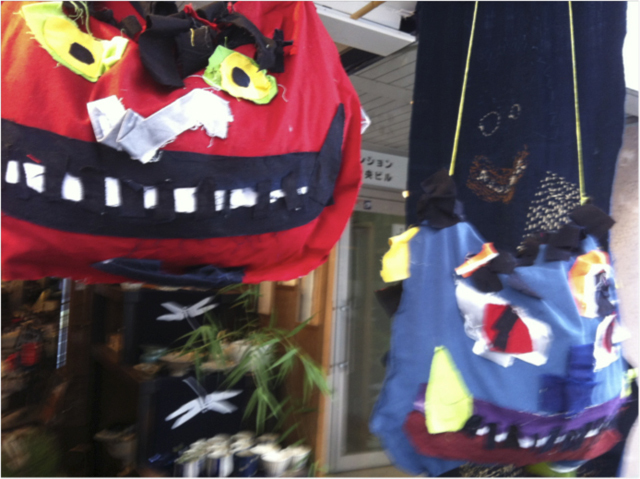 It is topped by three Mottainai demons made of leftover materials and tenugui ends. But notice that there is nothing sinister about them. They have humor. They have whimsy. That might just be a helpful way to perceive our demons. Difficult? Yes. But doable we hope. 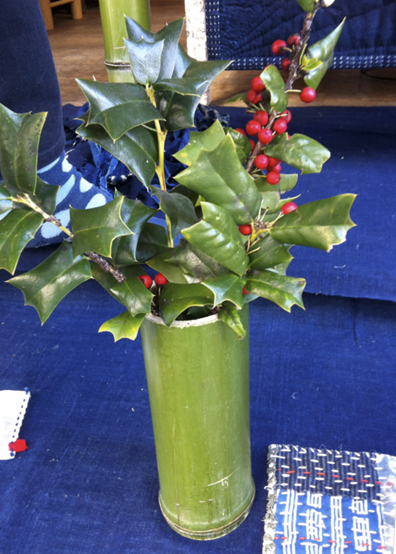 A masu filled with dried soy beans, along with a sprig of holly leaves (these leaves were cut and brought to Blue & White by a generous customer who, when she heard we couldn’t find hiragi/holly at any of the neighborhood flower shops, raced home to cut some from her own garden. The thorns of the holly are thought to be anathema to Devils. We all await the day at the end of the week, Friday, February 3,when we will throw the beans in the Setsubun celebration in the Azabu Juban Patio, just outside the shop – ONI WA SOTO (out with the devils) FUKU WA UCHI (in with good fortune). In comes our own personal Goddess, OTAFUKU, the Goddess of mirth and of joy. There is only one of her in the Demon window in Blue & White, but we are sure she can handle the enemy! She has that force ! 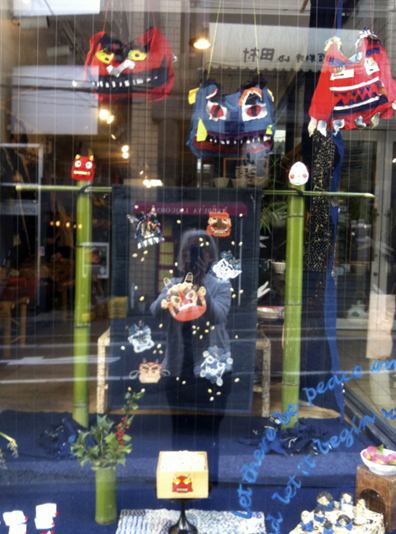 In the Okura Hotel, yesterday, we displayed an all-Otafuku window–not a demon in sight! 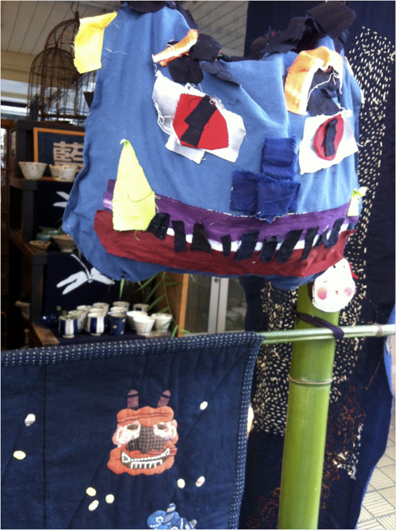 Another wonderful wild appliqued Otafuku creation by Rima Tashiro, our newest prolific artisan is featured along with a stick the eyes, nose, mouth and cheeks on the Otafuku blindfold game that is traditionally played for Setsubun. 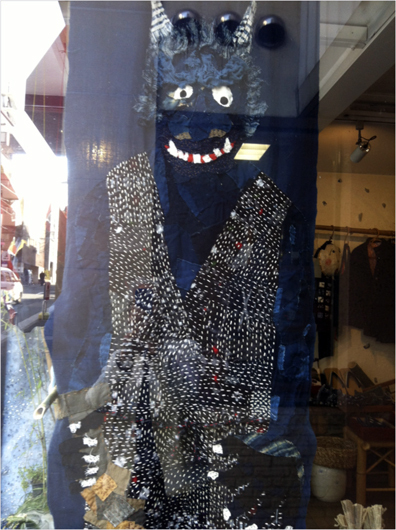 Rima also did the large very real looking standing devil in the Blue & White window. 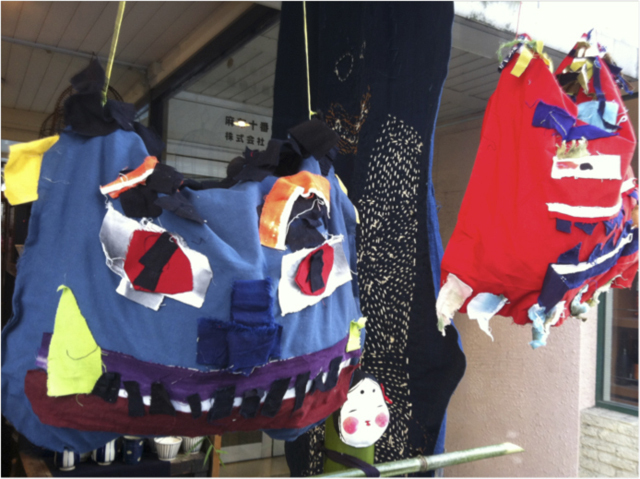 Working with scraps of indigo and other cuttings she had scavenged from the bags of leftovers at Blue & White, she has created wild and uncharted creatures that are rough and edgy. 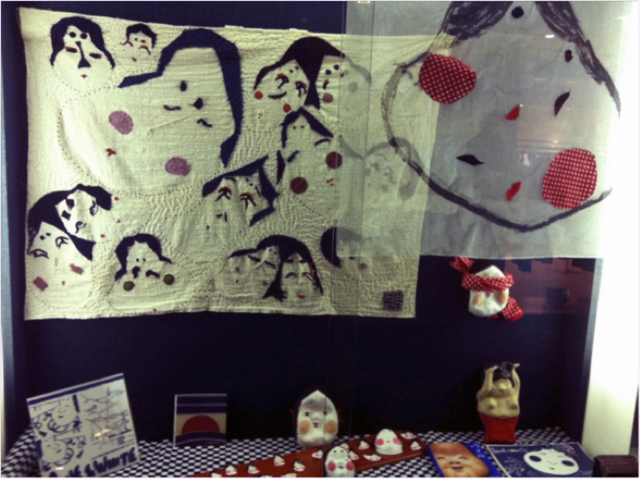 When I showed Julie Fukuda, who was passing by, a quilting QUEEN, with her own blog, My Quilt Diary, yesterday, she was hard put to put a name to Rima’s work. Textile art, she finally concluded. Nothing folded under, tucked in, everything exposed, rough edged and raggedy. A very uncomfortable approach for a meticulous, perfectionist quilter, but a new approach nonetheless. Windows are openings to the other side. They give access to what is beyond or within. Blue & White windows showcase things of season, the newly made marvel. They are our outreach to the neighborhood and we take pride in changing them frequently to surprise and delight passersby. Displayed masterfully by Sayoko Hayasawa, our windows are worth making a detour for. Quirky, beautiful, playful, they are our communication to the neighborhood that something new has come in, be it Setsubun or Girls’ Day, or some old blue and white dishes – already here or soon to come. But with windows, photos are taken from the outside looking in so they are unclear and reflective and lacking in details. Please bear with our technological failings and forgive the lack of clarity that windows cause – nor is the photographer blameless! Setsubun is a joyous time marking the end of winter, the beginning of spring and the scramble to banish the demons in our lives. Setsubun is still another new chance to put things right. Hooray, go Julie Fukada! I love her blog and she’s a talented lady. I’m getting excited about visiting you and wondering what will be in the Blue and White window on 10th April when Nat and I come to see you. Thank you for all the information about this interesting festival, it reminds me a little of one of our new year customs of bringing in a piece of coal (for warmth) and a silver coin (for wealth) on the first day of the year. Your window must speak to so may people as they pass even if they do not stop to come inside. I’m sure they carry the colours in their heads all day long! Lovely to see you reflected in the glass too! the last picture – you, the shop and the street is wonderful. It would be delightful to live in the neighbourhood and wait expectantly for each new display. Love, love the Otafuku applique. Thanks for the marvellous post. What an inspiring post. I too love the photo and the fact that you are reflected in it as well. How lucky am I to live close enough for regular Blue and White walk-bys and stop-ins. Thanks for your lovely store and all the creativity that bursts forth from it. It’s people like you who give us energy ! Keep up your needlework and great encouragement. What you do to us ! Next posting: tenugui and yukata dyeing.